In these lessons, students will learn how to read and respond to the text of the play. This will help them to gain crucial close-reading skills. Tasks include: an examination of Macbeth's soliloquies and what they reveal to the audience; using cross-referencing to trace the significance of a single word throughout the text, 'safe'; and a list of practice exam questions with an emphasis on language. Can I analyse quotations to establish what is being said and the context in which it is said? Students are given a set of cards with a number of words and phrases written on them, all things that characters say about other characters in Macbeth. Printable cards are included in the Lesson Plan download at the bottom of this page. Students should think creatively and find ways to group them, e.g. who they are said about, who says them, whether they are saying positive things or negative things, whether they are official titles or more personal and familiar ways of addressing each other, etc. Take feedback about pairs’ approaches and findings. descriptions of a character (not used in their presence). 2) Where on the line? Fiona Banks suggests that students should be asked to imagine a line down the middle of the room. The opposite ends of the line represent ‘Warrior’ and ‘Murderer’. Students then ask at regular points in the play (e.g. at the end of each act) ‘Is Macbeth a warrior or a murderer?’ Show students how powerfully they can express their ideas if they argue for their particular view of Macbeth at that point in the play by drawing on evidence to support their thinking. Students could then be asked to write evidence in the form of quotations on paper or on mini-whiteboards to support their claims. This activity could be repeated for other characters using appropriate words. Students could play around with the idea of nicknames and epithets, perhaps drawing on some of the evidence they have gathered from the activities here, and think of the most apt nicknames or epithets for the various characters in the play. How might these change as the play goes on? Students could stage a trial as preparation for ‘A Judge’s Verdict’. Choose students to form a jury who would decide on the verdict and then the judge would pass the sentence. The trial activity could be the basis for an assessment of speaking and listening, reading and/or writing. This learning sequence can be used to build on the text detective activities in the Key Stage 3 materials. 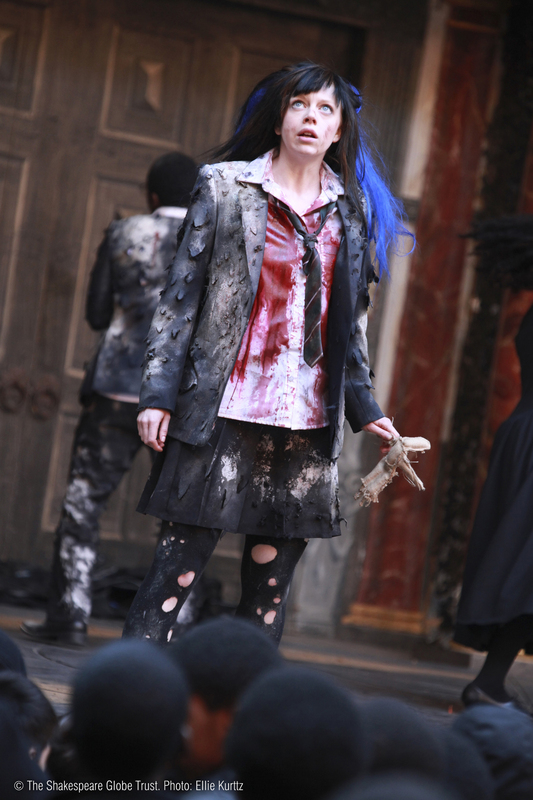 It can also be linked to other Key Stage 4 materials that look in detail at Macbeth’s character and language. An activity revising some of the literary techniques that were focused on in the Key Stage 3 Language Lessons would be useful here: alliteration, assonance, onomatopoeia, repetition, list, rhyming couplet, simile, metaphor. Students should draw a grid with all eight terms and space for students to record an example from the text. Assign students a particular scene or scenes to investigate and find quotes from; provide examples on strips of card depending on students’ confidence with scanning and skimming the text. 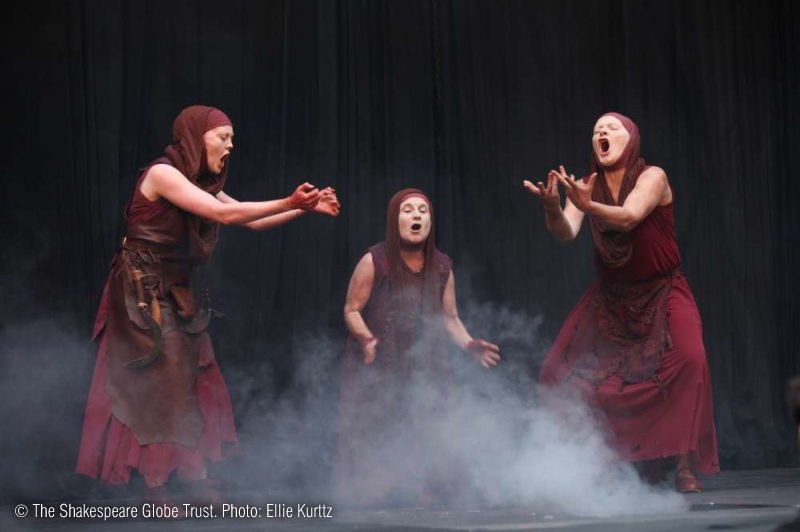 Explain to students that a very dramatic way in which Shakespeare varies the metre in Macbeth is by making the witches speak in a different way to the other characters. Students should now look at the quotations in the Student Booklet. The class could compile a brainstorm of anything they notice about how the witches’ language is different, e.g. tetrameter (four stressed beats), rhyming couplets, riddles and paradoxes, repetition, alliteration, shared lines, unusual words, etc. Model a close reading of the first quotation, paying particularly close attention to metre and language techniques and their effects. Students could then work in groups reading the rest of the excerpt, marking their texts with anything they notice about metre and language techniques and their effects. How regular or irregular is Shakespeare’s use of metre and why? What connections can I make between the metre and the meaning? How do I think the audience would be affected by the witches’ use of language? Students should take one of the techniques that they have learned about today, find an example of it from Macbeth, and write a sentence or two to explain what they think the effect of this might be in the context of the play. Take feedback. Students could also look at passages from other Shakespeare plays where tetrameter is used, such as A Midsummer Night’s Dream and King Lear. Why do they think Shakespeare chooses to write certain passages in tetrameter? One of the witches’ linguistic techniques is to say one thing but mean another. Catholic plotters’ use of ‘equivocation’ during the investigation into the failed gunpowder plot was big news when Shakespeare was writing Macbeth. The word is also used in the Porter scene. Ideas to support students in preparing for this learning sequence and which also involve the script machine can be found within the Key Stage 3 materials. An introductory activity on metre can also be found there. This learning sequence returns to the rhythms of Shakespeare’s verse and focuses in more depth on the intended effects of the language being used. Can I investigate Macbeth's and Lady Macbeth’s language to help me understand their various states of mind before and the murders? Can I explore layers of meaning in a scene through a range of drama techniques? The activities in this learning sequence focus on scenes featuring Macbeth and Lady Macbeth on stage together: Act 1 Scene 5, Act 1 Scene 7, Act 2 Scene 2 and Act 3 Scene 2. Begin by playing students (or showing them a transcript of the podcast) in which two of the actors who have played Macbeth and Lady Macbeth at the Globe talk about their scenes together. Ask students to make notes based on what the actors say about the relationship between Macbeth and Lady Macbeth and discuss findings. Word before: This activity helps students to listen to and focus on what the other character is saying. Students should read Act 1 Scene 7 and before they deliver their own next line, they should repeat one word from the other character’s previous lines. Interrupting and pausing: Read a passage from Act 2 Scene 2 in such a way that Macbeth and Lady Macbeth keep interrupting each other with their next line. Read another passage from the scene, leaving a 5 second pause before responding. Among other things, this is a great activity for thinking about the pace of dialogue in a scene. From here: Students think about the place and position from which they want to deliver their next line to their fellow actor. Before they say their line, they say ‘From here’ as they move into position. Try this with Act 3 Scene 2. 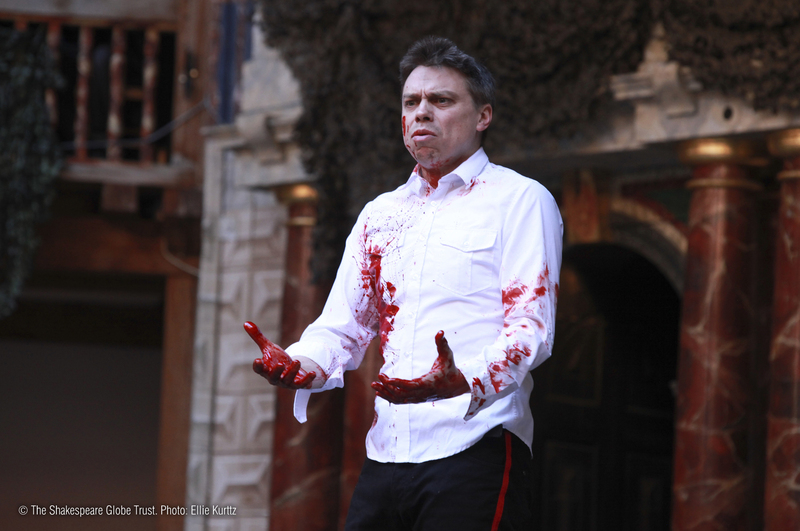 Q) How would you describe the states of mind of Macbeth and Lady Macbeth at this point in the play and how could this be conveyed to the audience? Q) How would you describe Macbeth and Lady Macbeth’s relationship at this point in the play and how could this be conveyed to the audience? How have these exercises and experiences of rehearsing and performing Act 2 Scene 2 deepened students’ understanding of character and language in this scene? Students should choose either Lady Macbeth or Macbeth and write about their different emotions throughout this scene, and how this is reflected in that character’s language. What have I noticed about Macbeth’s and Lady Macbeth’s language before, during and after the killing of Duncan? What clues can I find in their language about their states of mind and about their relationship as the play progresses? Students pair up with someone from a different group and compare their Revision Diary entries. This ‘pairing and comparing’ could be repeated two or three times. Take feedback on how students have interpreted the language and performed the scene differently and celebrate these differences! 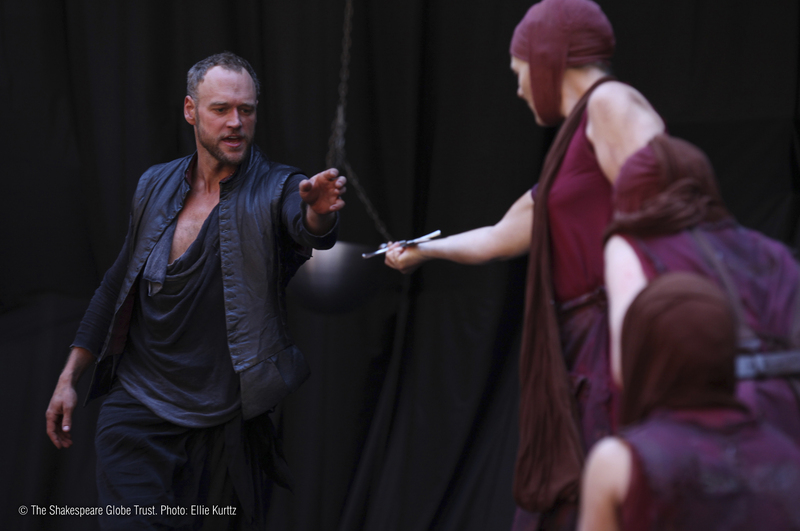 To find out more about actors' thoughts on the relationship between Macbeth and Lady Macbeth, students could visit the Adopt an Actor archive, read Harriet Walter’s Macbeth, or research reviews and interviews with actors who have played these parts on stage or screen. Worthwhile links could be made to the Text in Performance activities about the role of the director within the Key Stage 3 materials, and to activities within the Key Stage 4 materials about the role of the stage manager. Do I understand what is meant by a soliloquy and an aside? Can I explain how the soliloquies in Macbeth can help the audience to understand characters’ complexities and vulnerabilities? Clarify the meaning of ‘vulnerability’ and ‘complicit’ with students. Ask them what they think Macbeth’s and Lady Macbeth’s biggest strengths and vulnerabilities are. These ideas could be recorded on something that will help students to remember the meaning of the word, e.g. on colour-coded sticky notes. 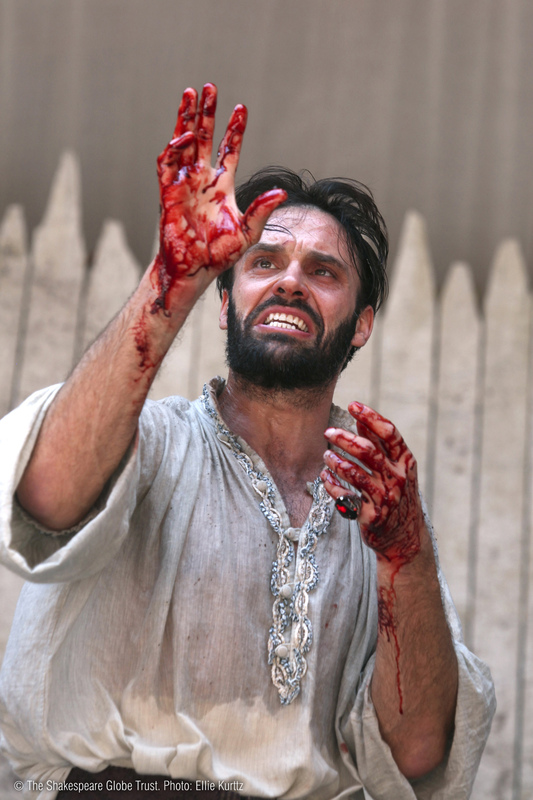 Q1) Does Macbeth speak these words alone on stage or are other characters present? If so, who are they? Q4) What do you notice and predict will be the difference between Macbeth’s language in his soliloquies and in his other speeches? 2) Whose line is it anyway? Give each student a line from Macbeth’s soliloquy from Act 2 Scene 1 lines 33 - 64 on a strip of paper. Ask a few questions to get students thinking about what’s written on their strip of paper, e.g. Who’s got the line where Macbeth takes out a real dagger? Who’s got the line where Macbeth describes what he can see on the dagger and its handle? Who’s got the line where he worries that his footsteps might give the game away? Now read through the entire soliloquy, with each student reading his or her line. How does a soliloquy guide us through a character’s thought process? Students can listen to an original pronunciation version of Macbeth’s ‘Is this a dagger which I see before me’ speech on David and Ben Crystal’s Original Pronunciation CD. As a possible discussion point, students could debate whether Lady Macbeth’s speech is a kind of soliloquy, because she doesn’t know that the doctor and waiting gentlewoman are present. A comparison could be made with passages from Hamlet or from Much Ado About Nothing, for example, where characters think they are alone but someone is eavesdropping. Which words are used most of all by Shakespeare? It will come as no surprise to students that the most common words in Shakespeare’s plays are very short useful words: the, and, I, to, of, a, you, my, in, that, is, not, with, me and it. Students can find the exact statistics at opensourceshakespeare.org/stats. Ask students to jot down what they think the commonest words in Macbeth are, leaving short words like pronouns and characters’ names aside. After giving students a few minutes for this activity and taking some feedback, show students a Wordle-generated word cloud showing the 100 most commonly used words in Macbeth. Assign one of the most commonly used words to a pair or group of three. Students have a certain amount of time to find as many examples of that word in use in Macbeth as they can, either using an online concordance or scanning the text. Suggested words to use: good, king, fear, death, heart, done, night, time, blood, sleep, make, air. Then take feedback about the word’s meaning or meanings in the play. Students could choose how they do this feedback, e.g. dramatic presentation, choral speaking of important quotations, mindmap or poster with commentary by the students. Ask students to read this extract and place it in context. Explain that this activity is not about language features so much as diction, i.e. Shakespeare’s word choices. As students read they should look for the same words they searched for in the previous activity. How many of them can they find? Perhaps students could do what Fiona Banks calls ‘thematic heckling’, echoing the word to draw attention to it! Then divide the extract up into five sections of ten lines each. Students should pick out what they feel are the three most important words within their assigned section. Students should then go beyond the twelve words they looked for in Activity 1 and pick out the other words they feel are particularly crucial in this passage. Which words (or closely-related words, e.g. dead/death, man/manly) are repeated? What effects does this repetition achieve? What do students understand by the word ‘safe’? Students should work in pairs and draw a word-web incorporating their ideas. by someone who is lying through their teeth? by someone who is reading a story to a very young child? by someone who is not telling the whole truth? Students could develop role plays in modern English to flesh out these scenarios. Use this activity to help students think about the importance of establishing the context in which something is said and the tone that is being used in order to interpret possible meanings. Now – with reference back to the use of the word in the previous activity - ask students to focus on the word ‘safe’ in Macbeth (and also words which have ‘safe’ as a root-word such as ‘safely’ and ‘safety’). Can they think of or find examples of this word in the play? What do they think it means? What does it mean to different characters in the play? Now give students a handout featuring an extract from Nicholas Royle’s book How to read Shakespeare, in which the author takes one word from seven of Shakespeare plays and devotes a chapter to each word. Even on the first appearance of the word ‘safe’ in this play, Shakespeare seems to be playing with safety regulations: ‘safe’, in other words, seems untroubled, ironic, unsafe. Having in an earlier aside entertained the thought of regicide – a ‘thought’ of ‘murder’, however fanciful or ‘fantastical’ (1.3.138) – Macbeth tells Duncan of his duty towards the King and his concern for ‘doing everything/Safe toward your love and honour’ (1.4.26-7), in other words doing the utmost to secure his safety and be deserving of his love and honour. There is thus already a lurking suggestion here that to be ‘safe’ is to be dead. 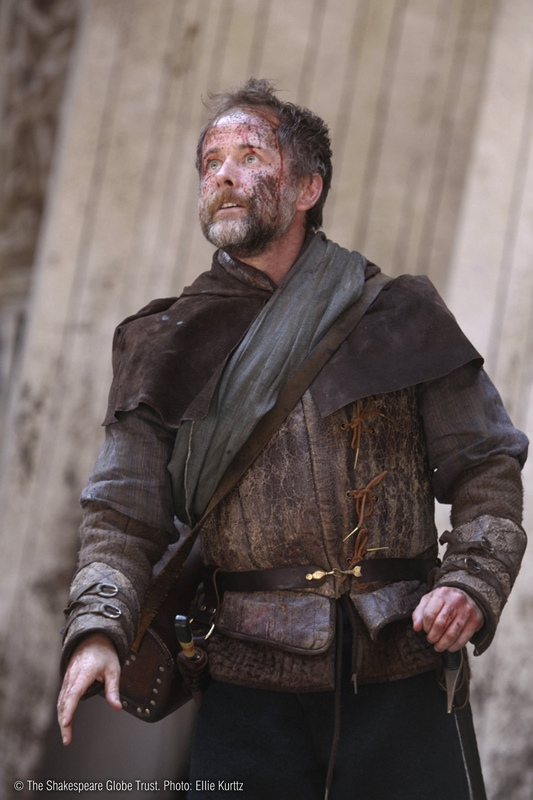 It is as if Macbeth (and the reader or audience) could already foresee the moment in Act 3 scene 4 when Macbeth, seeking confirmation that Banquo had been done for, asks ‘But Banquo’s safe?’, and the First Murderer replies: ‘Ay, my good lord: safe in a ditch he bides; (3.4.25-6). Discuss the ideas Royle raises here. Ask students to bear in mind as they read that a short and seemingly simple world can withstand very thorough analysis! Which words have I noticed Shakespeare uses repeatedly in Macbeth? Students choose one word from Macbeth they have looked at today that could in some way be said to have more than one meaning or a more complex meaning than they first thought. Students should write down a few sentences about their word, and then a range of words and commentaries can be shared. Wordle (wordle.net) can generate a variety of word clouds to support analysis of Shakespeare’s use of language in Macbeth, e.g. the commonest words in the whole play or in particular scenes or speeches, the language used by different characters, how Macbeth’s language changes. The close reading of the second part of Act 1 Scene 3 can be linked to the close reading of Act 1 Scene 3 lines 1-89. This can be found under KS4/5 Language. Ask students together as a class to create a brainstorm showing everything they already know about using quotations in essays. At this point in the lesson, some of the following issues will come up, whereas others can be integrated into the lesson subsequently as appropriate: appropriateness/relevance, length, key words, use of speech marks, use of ellipsis, use of square brackets, use of integrated quotations, direct v. indirect quotation. Students should then choose from each long quotation a memorable shorter quotation (between 1 and 8 words in length) and highlight them in the Student Booklet. Students should choose another relatively minor character from the play (e.g. Donalbain, Lennox, Rosse, Siward, Seyton, Doctor) and write a paragraph assessing their role and significance in the play. Which study skills do I need to identify key quotations and learn them when revising for an exam? 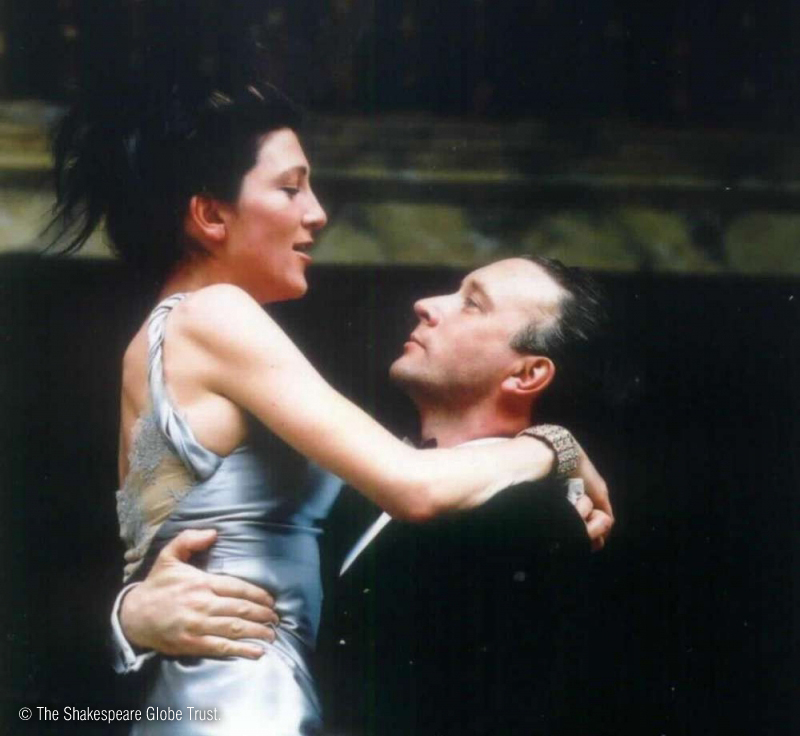 As well as searching for words, students can also search by character and create a print out of all of a particular character’s lines at opensourceshakespeare.org. The next two pages take students through the process of writing an essay about Macbeth. Choose a soliloquy from the play and write a detailed analysis of what it reveals about that character’s thoughts and feelings. How does the language of the witches in the play mark them out as different to any of the other characters? What effects do you think Shakespeare achieves in these scenes? How does Shakespeare use language to convey to the audience the nature of Macbeth and Lady Macbeth’s relationship? Choose three scenes in the play from which to draw your evidence. The following page continues to work through the process of writing an essay about Macbeth. Following on from the modelling of planning in the previous learning sequence, students could plan their essay with your support as appropriate. the argument they are advancing in that paragraph. Encourage students to include in their Student Booklet at least one practice essay and all the evidence of their entire writing process, from brainstorm to plan to first draft to finished draft. This will help you to assess their writing process as well as the end result. This learning sequence and the previous one take students through the process of writing an essay about Macbeth. The essay can be used as an end-of-unit assessment task, assessing reading and writing.